You can use a story to preserve multiple iterations of an analysis and then play them sequentially to provide a narrative about the analysis data. For example, you might want to see several versions of the analysis, all with the same charts but with different filters applied. A captured iteration of an analysis is called a scene. A scene preserves the visuals that are in the analysis at the time you create it, including such things as filtering and sort order. The data in the visuals is not captured as part of the scene. When you play the story, visuals will reflect the current data in the data set. Every analysis comes with a default story called Storyboard 1. 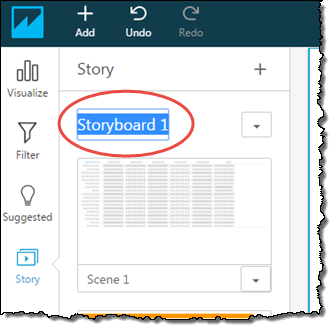 When working in an analysis, you can add scenes to Storyboard 1 by choosing Capture on the application bar. 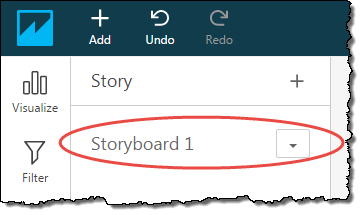 You can rename Storyboard 1 by using the procedure in Rename a Story or Scene. You can create additional stories as needed. 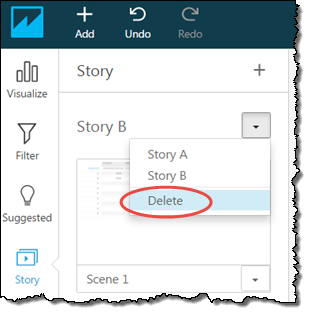 If you have added other stories to the analysis, choosing Capture adds a scene to whichever story is currently selected. 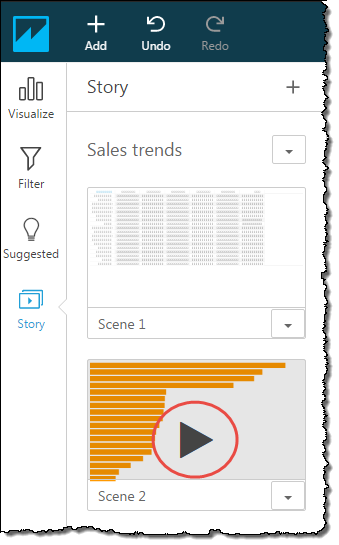 You can view the currently selected story for an analysis by choosing Story on the tool bar. To see or select other stories, choose the expand icon next to the currently selected story. Use the following procedure to create a new story. On the analysis page, choose Story on the tool bar. Choose the add icon (+) at the top of the Story pane. Type a story name and then choose OK. The new story is set as the current selected story. Choose Visualize on the tool bar to return to viewing visuals again. 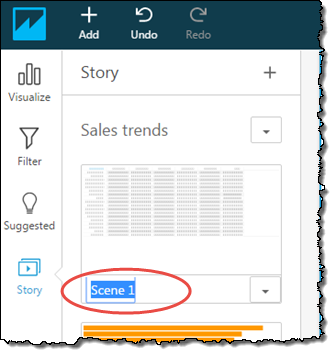 Whenever you want to capture the current state of the analysis as a scene in the story, choose Capture on the application bar. You can rename stories, and also scenes within stories. Use the following procedure to rename a story or a scene. Select and drag to highlight the story or scene name you want to change. Type a new name and then press Enter. Use the following procedure to play a story. Choose the play icon on the scene you want to start playing from. The story plays, opening on the scene you selected. Choose PREVIOUS or NEXT to step through the scenes in the story. To stop playing the story, choose STOP STORY. 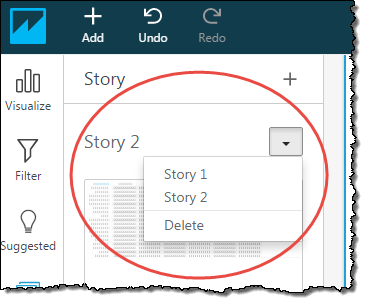 You can delete the currently selected story by choosing the expand icon next to the story and then choosing Delete.